We used to call it the "3 finger salute" in my programming classes: when your code was so bad that you crashed your computer and had to hit ctrl-alt-delete and start over. The Federal Escape Olympic last year really rocked my world. I did so poorly that it forced me to reconsider my plans for the entire year and finally drop my race schedule completely. Even though it was 7 months ago I am just now adjusting to our "new" family schedule of school, sports, and other activities which has forced me to limit me to only 17 rides since last Labor Day. Bike commuting: Rain, Rain, Go Away! Sounds like a lot, eh? I actually have more than that in store. Even though I haven't updated my site since BEFORE Lance confessed to the big "O" my site is getting more hits than ever. Triathlon is a great sport. I hope I can contribute even more to it. Posted in Commentary, Post-season, Pre-season, Website. March 5, 2013 by Lee Donnahoo. So today Lance gave up his fight against the USADA. I can imagine him throwing his hands up in the air shouting, "Fine! Whatever! I'm done!" He's not gaining a lot of sympathy, being called a liar and a cheat, but the impact of this controversy may actually hit your's truly. Why, you may ask? Because, empowered by the publicity of this campaign, the USADA is greatly expanding their testing of amateur athletes. I am torn on this issue. My position on professional athletics is that they should all be tested. How they do the testing and the process for appealing and monitoring for corruption is another debate that I will not attempt to address herein. What about amateurs? Is it OK for someone who competes on an amateur level to abuse testosterone, EPO, HGH, etc.? (Hint: quite a fewactually do) No, they should not but should they be subject to the same rules, guidelines, and procedures as the pros? Like I said, I'm torn. There are a lot of hobbyists (like me) and weekend-warriors who have no clue about the USADA/WADA guidelines for banned substances (and have no interest in learning). I have frequent sinus and allergy issues and my favorite remedy (pseudoephedrine, the main ingredient in Mucinex-D, Sudaphed, Claritin-D, Zyrtec-D, and a host of other drugs) is a banned substance. What other supplements, drinks, or medications do I take that are also banned? I really don’t care. I have made it clear that the reason I'm racing has nothing to do with the other competitors on the course. I don’t race in an attempt to beat someone else: I race against myself. If you think that statement is ludicrous I point you to my last race result where it is clear that I had no chance at a podium finish in my age group, let alone the entire race, and probably never will. My personal schedule and commitments do not allow for the level of training necessary for me to be even an AG competitor and certainly not on the overall category. Maybe after my kids are out of the house (8-10 years in the future)? So here’s the punch line: no one need fear me beating them at a race. If they ask me to be tested I will politely decline and then avoid sanctioned races while I wait out my inevitable suspension in protest. I’m not going to change my diet/nutrition to appease the USADA and their doping policies just so I can compete in a sanctioned race. I don’t need the hassle. An interesting side note: Why is doping so prevalant? Because it works. Another update: BEST POSITIVE DOPING TEST EXCUSE EVER!! Posted in Commentary, Cycling, News Articles and tagged with USADA, cycling, doping, news, triathlon. August 24, 2012 by Lee Donnahoo. What is STP? It is the annual "Group Health Seattle to Portland Classic" put on every year by the Cascade Bicycle Club, an advocacy and education group based out of Seattle. "Oh, you ride a bicycle? Have you ever done STP?" "I want to ride STP this year. What bike should I buy?" ...and the questions don't stop after the ride, they keep coming. Every year it sells out (at 95% capacity as of the time of this writing according to the Cascade website) with a capacity of 10,000 riders. If each rider was given a 10 second start before the next rider it would take them nearly 28 hours to get everyone on the road. If every rider was evenly spaced every 10 feet they would stretch out 19 miles (from UW to the 405 overpass in Renton). This ride is famous for being one of the longest running, best supported, and best attended rides in all of the U.S. with people coming from all over the world. It is also infamous for HUGE pace lines, large groups of riders of varying abilities, and mile-after-mile of narrow rural roads through some of the least scenic areas of a very beautiful state. A 10,000 person cattle-drive down a non-scenic 200+ mile route? Cycle Oregon 2009. Cruising down highway 96 along the Klamath River on my way to Happy Camp, CA, in the gorgeous state of Jefferson.I appreciate the draw of a popular group ride that is well supported (which this one reportedly is). 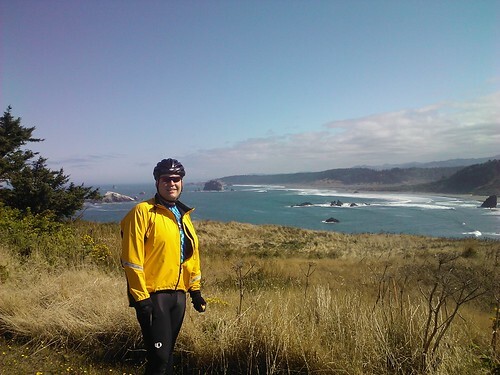 I have done numerous group rides including Bike MS, the Flying Wheels Century, Cycle Oregon, and Tour de Blast. I have nothing against big group rides but there comes a point where they are just too big. As a comparison Cascade also sponsors RSVP or "Ride from Seattle to Vancouver and Party", a ride of similar distance but greater elevation gain, which has a MUCH better scenic factor and far fewer people (1400 split between 2 groups). I would much rather ride RSVP than STP, plain and simple. I will never do STP no matter how many people ask me if I have ever done it. I would rather ride from Seattle to Portland on I-5 in front of a sleep-deprived trucker while being forced to listen to the Bee Gees greatest hits album. I’m sure I could exploit this further for comedic purposes but I have better things to do with my time. When I finish a ride I want to be able to say, "That was an amazing ride, can we do it again tomorrow?" The last thing I want to say is, "Wow, what a nightmare. I'm never doing this ride again." I ride for the pure enjoyment of riding, for the views, and for the opportunities to see new countryside. Doing it on a bicycle provides a connection to the road and the earth that you simply can't get with a car. When was the last time you finished an all-day drive somewhere and said, "That was an amazing drive, can we do it again tomorrow?" Posted in Commentary, Cycling and tagged with bike touring, cycling. February 20, 2012 by Lee Donnahoo. "So long 2011, don't let the door hit ya in the rear on the way out..." - My Sister, as posted to FB. Cycle Oregon 2011 - "Going Coastal"
No more excuses. This year was lame. Next year will be better. At the Beaver Lake Tri I learned that my bike training was terrible. I did PR on the swim but came no where close on my bike/run goals. On the Tour de Blast I learned that the best weather preparation in the world only works if you actually bring your bad weather clothing on the ride. I won't be making that mistake again. Otherwise it would have been an EPIC bad-weather ride. Cycle Oregon 2011 once again proved that my bike training this year was poor but that is the only thing bad I have to say about that ride. It was amazing in almost every way. I am waiting with baited-breath for the 2012 kick-off Party where I will finally decide whether or not I'm going to kill myself to get there in 2012. Focus earlier in the year on distance running and cardio volume. My best and more consistent results are still from bike commuting, which I try to do 3-5x per week during the spring/summer and early fall months. Posted in Commentary, Cycle Oregon, Cycling, Post-season, Swimming, Training and tagged with Cycle Oregon, cycling, running, year in review. January 4, 2012 by Lee Donnahoo. Note: I recently posted an updated version of this article. Triathlons are not for the faint of heart and, apparently, not for the thin of wallet. "According to a study initiated by USA Triathlon, the average triathlete is a married 38-year-old with an income of $126,000. Forty-four percent have kids living at home; 60% are male. They spend in excess of $4,000 annually on bike gear, athletic footwear, race fees and nutritional supplements. Nearly half have traveled more than 500 miles for a race." $4000 a year on gear, race fees, and food? PER YEAR? Seriously? If it doesn't turn out to be a fad then there is significant money to be made marketing/selling gear to triathletes in the coming years. ...Unless that triatlete is me. I may be squarely in the demographic quoted above but I spend NO WHERE NEAR that amount of money on my craft. Is it possible to be a triathlete and do it on a shoe-string budget? ABSOLUTELY! Let's break it down into the main categories mentioned in the article above and see how you can do it without breaking the bank. To be fair to all you lady triathletes out there I called upon an old friend, Valerie, who finished her rookie race this past year and did it for just-over $200! TIMING IS EVERYTHING: Best advice I can give you - plan what you need NOW and start researching and window shopping. Notice I didn't say buying? That comes later. If you wait until the last minute to find what you need you will either spend WAY too much (i.e. list price) or find yourself loaded down with worthless gear that doesn't fit or meet your needs. Once you know what you are looking for, you can take your time and wait for the right sale. The best time of year to buy gear is the last month of the season and the 2 months following (August-October in North America). That's when shops are clearing out the current year's merchandise, prepping for Inter-bike, and getting ready to stock up on the latest products. If you can settle for the previous year's clothing or gear you can save some serious dough. Deal Websites: My favorite site lately has been Steep and Cheap but you can also find great deals on Amazon and many others. Also look for "deal of the day" on sites like Western Bike Works, REI, and Competitive Cyclist. These sites are great but if you don't know what you are looking for they are useless. Do your footwork first and they are much more valuable. Clearance Sales: The REI seasonal clearance sales, the clearance section of just about any shopping website, and even Performance Bike and Bike Nashbar are a great place to find hidden gems. Case in point: My bike commute shoes are a pair of size 49 Canondale Roam shoes. I found them on a fluke on Bike Nashbar for nearly 75% off (less than $30). The Clearance Rack: When I go shopping at any store (clothes, electronics, and especially sporting goods) the first place I go is the clearance rack/section. Some of my best finds have been at REI, the Nike Factory store, and, yes, Target (amazingly low prices on basic workout clothes such as base layers for running). Go to ALL of your local bike stores (LBS) and check out their clearance rack/table. You will be surprised what you can find marked down by 80% (like every set of gloves or glasses I have ever worn). I put this first because it crosses boundaries with the different disciplines on race day and, most of the time, while training as well. Tri top: This is where there is the most flexibility. For short races a normal bike jersey will do but for the longer races you need something that won't chafe your armpits or other sensitive upper-body areas. Once again, Pearl Izumi Tri Top (Sleeveless) is a good choice. List price: $55. Tri Suit: The even cheaper way to go is to combine the jersey and shorts into a tri suit. The Pearl Izumi Tri Suit lists for $99, $10 cheaper than the shorts and top combination. I hate to sound like a broken record for Pearl Izumi but they seem to have a lot of clothes that fit me (size XXL). There are other options out there but they are harder to find and more expensive. That about covers race day clothing but race day itself is less than 1% of the total time you will spend all year in your sport. The rest is spent training. While training, especially on single-sport days, you can wear something a little more tailored for the current sport. If I'm going to spend 120 minutes on the bike doing a long ride I would much rather be wearing bike-specific shorts. There is a lot of flexibility there. I will cover each individually below. Race Swim Suit: See Tri shorts/suits above. For race day there really is no substitute. I actually saw a couple of women changing in T1 during a race. One would hold up a big towel around the other while she changed, then they would switch. Their T1 times must have been somewhere around 10 minutes. Training Swim Suit: This is where you can get ultra-cheap. Any suit that fits for swimming, and allows for freedom of movement, should do the trick. I use a cheap pair of swim trunks while Val uses a speedo that she has had for years. Goggles: Talk about cheap! You can get goggles for as little as $5. I use the Speedo Futura Biofuse Swim Goggle which I picked up from a local sport retailer for $10. Just as with any equipment it has to fit. Swim Cap: Since these are provided with your race this is one of the few no-cost items on the list (well, almost no-cost, since race entries aren't exactly free). Wet suit: This is by far the highest priced item in the swim section. For race day wet suits can be rented in most major cities for anywhere from $40-70, depending on type and length of rental. If you live in an area where you must train using a wet suit (like I do) then purchasing one may be a better deal. These can cost anywhere from $100 to as much as you want to spend. Second hand wetsuits are plentiful around the end of the season via Ebay, Craigslist, or even your favorite retailer (think rentals models clearance). I bought my wetsuit for $150 from Steepandcheap.com, a 2XU sleeveless wetsuit. The Bike: There are no other pieces of equipment in your list that will meet the cost of the bike. You can use an existing bike (like Val did), buy a used bike for under $100, or spend as much money as you want (the sky is the limit in some cases). Now, before you run out and spend more than the value of your car on a real tri-bike, remember that even Chrissy Wellington won her first Ironman Kona on a bike with clip-on aero bars. Of course it was a Cervelo P2C tricked out with full Dura-ace groupo and an HED wheelset. Even Lance said, "It's not about the bike." The best place to start is a bike that fits your budget and your body. You should spring for a pro bike-fit to prevent long-term body issues and injuries: a post-purchase bike fit is covered by most insurance companies to make sure your bike is adjusted to fit your specific body needs. Bike Accessories: After you buy a helmet (required at all races in the US) the basic item you need is some type of hydration (i.e. water bottle and mount). The cheapest are only a few dollars. Other essential items are bike shoes, with compatible pedals, and perhaps a bike computer. My friend Val went old-school with a set of clip-pedals for under $20, which is what I would consider the bare minimum for any race. Without clips or a clipless pedal/shoe combination you cannot capture the energy of upward/backward pedal strokes. Repair Kit: Some racers, especially in the elite class, really go light on their repair kits or even skip it completely. If you, like me, are one those "finish at all costs" type of athletes then a good repair kit is essential but it doesn't have to cost much at all. A basic flat kit, an extra tube, and a CO2 pump will weigh only a pound or 2 and can cost less than $20. Bike-specific Clothing (Training): Jerseys and shorts can be a very personal item in terms of fit, use, and style but one thing is for sure: a good pair of bike shorts goes a long way. Or at least it can help you go a long way with lower body impact than a cheaper pair of shorts. Best advice I heard early on: buy a really cheap jersey and use the money you saved to buy the best shorts you can afford. Your nether-regions will thank you later (as opposed to screaming). Running Shoes: Along with tri shorts, running footwear is another area where you should be careful about getting overly cheap. Properly fit footwear is the first requirement but it must also fit your running style. A quick visit to a podiatrist or running store for a gait analysis (i.e. how do you run?) will help determine the best type of shoe. I have been wearing Asics Gel Kayano shoes for the past several years and LOVE the feel, although I have been experimenting with minimalist footwear as well. Once you know what works best for you there is nothing to stop you from buying online. My favorite source for shoes has been Ebay. Search for your specific make/model/size of shoe and you can find screaming deals for as much as 50-70% off, especially if it is "last year's model". Run-specific Clothing (Training): This is where I get super cheap. My running shorts, shirts, and base layers come from either the clearance rack at Target or my local sporting good store. Total cost: $15 per set. This one can get a little ridiculous if you are not careful. In 2009 I completed 3 races, 2 sprints and an olympic distance. My total race fees for the year: $222 ($72, 75, and 75 respectively). Gels, Protein Shakes, jelly beans, etc: This one is like arguing religion or pizza toppings (very contentious in some cases). No matter your preference in this category you can find numerous vendors our there and, if you shop smart, you can find good deals. Watch the clearance sales and bulk buy web sites for the best deals. I usually spend less than $50/year on nutrition. How much did I spend in 2011? My 2011 total: $355 (i.e. nowhere near the $4000 number above). Was this a typical race year for me? Well, almost. My race fees would have been about $150 higher (i.e. 2 races) if I was able to better coordinate my schedule. In 2012 I'm shooting for at least 3 races, 1 of them a half-iron distance (i.e. 70.3 but it's not an M-dot event). For those races I will probably purchase another set of running shoes for use beginning in May and I am in the market for a tri-suit for that longer race. The moral of the story: you can EASILY spend less than $1000/year on triathlon gear and race fees if you are careful. I will grant that my goals are not as lofty as some. If you are shooting for 1 or more Ironman races this year (140.6) then your budget may be a bit larger. Spending that much time in training puts a lot of stress on your body and clothing which wears it out faster and sometimes requires you to buy the more expensive clothes in the first place. Posted in Commentary, Reviews, Training and tagged with economics, training plan, triathlete, triathlon. January 1, 2012 by Lee Donnahoo. For 4 months out of the year I commute home in the dark. Not sunset, dusk, or twilight, I'm talking the dark of NIGHT, the witching hour, when good little boys/girls turn into pumpkins... OK, I'm out of lame darkness-related sayings. It's dark. On December 21st Seattle gets 8 hours and 25 minutes of daylight (sunrise to sunset). On the flip side we get nearly 16 hours of daylight on June 21. It is SOOO fun going for a bike ride at 8pm and coming back an hour later and the sun still hasn't gone down, but I digress. Back to the dark. During the dark months of the year riding home in traffic is scary. Are you visible enough? Are the drivers paying attention? And if it is raining all bets are off. I wrote a lot about bike safety a while back and have strong opinions about what I think it takes to stay safe on the roads. Being visible is one of the most important things you do to improve your night time safety. Can you spot the ninja cyclist in this video? What if you could be brigher without breaking the bank? I started off my winter riding career with the basic Cateye front and rear lights (similar to the HL-EL135 and TL-TD150 respectively). It only took me a couple of night-time rides to figure out that these lights simply would not do. "Be Seen" Lights - cheaper lights that flash or strobe and are used primarily to increase your visibility. They are not very good if you actually want to see the road on a dark street. Cost: usually less than $20 each. Headlights - These lights are bright enough to allow you to see the road/trail on a dark night with no other light sources around (i.e. street lights, the moon, or other vehicles). Cost: the cheaper ones start at $50 and go up from there. But I was unsatisfied with my overall visibility at night. One day I was shopping at REI and found a couple of products that would fit the bill: increase visibility at a low price point. The lights came with basic instructions for installation and battery insertion. No need for complicated tutorials here, these lights are pretty simple. Putting these lights on my bike was relatively simple. On the Bike Glow I attached the battery pack and wound the light cord around the bike frame, securing the end with the included zip tie and electrical tape. The Orbit light was even easier: attach the center groove to a spoke and slide it toward the rim until the ajoining spokes secure the sides in place. The "before" shot - riding with just my front and rear lights. The "middle" shot - riding with just the new lights. "After" - All lit up and nowhere to go (yet). Great attachment to the spokes, very solid. We'll see how it wears over time. Uses a very common battery. Doesn't distract the rider's eye during use. Difficult to turn on/off without the right leverage. Only available in 1 color (amber). Battery pack uses velcro strap and rubber to stay in place: very secure. Zip ties and electrical tape included for installation. Doesn't distract the rider's eye during use, even though it is visible (depends on how you install). On/off button is easily accessible (I mounted the batter pack right below my seat on the top tube). Emits a very high frequency whine during operation which is only audible when not moving. When the light is in the flashing mode the whine goes on and off with the light. These lights are cool and draw a LOT of attention. They greatly increase your visibility from the side where my other lights are primarily focused on the front and back. What about battery life? Not enough experience to guage this one. The Bike Glow runs on a 4 x AA batteries while the Orbit light uses a pair of CR2032 batteries. So far they have survived a couple weeks worth of night commuting with no issues or run-downs. The only downside that I can see is that they may attract TOO MUCH attention. They may cause people to gawk and increase other risk factors. Right now it's fun to tell people about them. My kids saw it and immediately started calling my bike a light cycle and have named it "Flynn" after the main character of the movie Tron. Posted in Commentary, Commuting, Cycling, Reviews and tagged with bike commuting, commute, cycling. December 17, 2011 by Lee Donnahoo. A quickie about an animal interaction I had years ago while riding my bicycle. I remembered this little incident after reading about another unfortunate racoon-related crash. When I was 16 I worked at Kmart in Roseburg, Oregon, on evenings/weekends. On one particular summer evening I was riding my bike home at twilight (no headlights) along a bike path through Stewart Park. A skunk came out of the bushes and tried to cross the path from left to right. I hit my brakes and shouted, “HEY!” It stopped in the middle of the path, juked left, and then kept going right across my path going between my wheels. I thought for sure I was going to hit it but miraculously I didn’t go down. I had to stop to catch my breath and let my heart rate come down before continuing home. Was I going to fast in low light conditions? Yes. Did the skunk really go between the wheels? Yes, it did. I wasn’t going more than about 8-10 MPH by the time he did, since I was hard on the brakes and trying not to fall over. There is no way it could have gone from one side of my bike to the other like it did without going between my wheels. At least the skunk didn't try to do a victory dance on my head. And it wasn't a bear. Or a Red Hartebees (AKA antelope). Anybody else with a fun animal/cycling interaction to share? Keep the rubber side down, folks! Posted in Commentary, Cycling and tagged with bike commuting, cycling. December 16, 2011 by Lee Donnahoo. This post is the third in a series on bike commuting and covers some of the "how" related to bike commuting. Other posts include How?, Why?, When?, and Weather Issues. Update: Active.com just posted a great article titled "How To Handle a Bike Accident With a Vehicle." It's a great read outlining the steps you should take if you are involved in a bike/car accident. The same principles apply in just about any moving-vehicle accident. "So what do you do if you're in a cycling accident with a vehicle? If you're healthy enough to walk away from the crash site, that doesn't mean you should consider that the only victory you need. Instead, take these steps to make sure you're as protected as you can be." "It rains 9 months of the year in Seattle." "It is really dark for 6 months out of the year." "Wait, don't you live at the top of a big hill?" My first response is typically a rip-off of Dr. Sheldon Cooper: "I'm not crazy, my mother had me tested." Well, she didn't actually have me tested but it does get a laugh. Am I crazy for riding in the rain? Sometimes I wonder about that myself. I bike in all weather except snow/ice. Cold and monsoon rain? Check. Dark when I leave in the morning and dark when I get home in the evening? Check. Dark and raining so hard that you literally POUR water out of your shoes? Check. When I walk in the door, dripping wet and soaked through to the skin with a smile on my face, my wife always looks at me funny. Me: "Wow, I feel like a wet rat." It is possible to be soaking wet and still warm but I'll leave that for a future post about commuting in the rain. Boy #3 looking out over the great expanse of the Cascades from Rattlesnake Ledge just east of Seattle. I could write page after page after page of basic safety information but I'm sure most of you don't need to partake of that particular brand of sleep-aid. Countless other folks have addressed that issue far more eloquently and authoritatively. I can't get away from some of that but, instead of waxing profoundly obvious, I hope to contribute some of the things I do that may be unique, peculiar, or just plain odd. Riding a bicycle on roads in the U.S. is a risky proposition no matter how you slice it. You could be riding along a country road, minding your own business, when *BAM! * you are hit from behind by a driver with a suspended license who isn't paying attention (driver in this case claimed to not even know he hit a cyclist and continued on his way to work). You can't avoid the bad choices of other nut-jobs out there but you can make it easier for them to see you and avoid getting into a bad situation. A friend from work, who commutes by both bicylcle and motorcycle, gave me this advice a couple of years ago: "Treat all cars as if they don't see see you. You are invisible to them." The rider in that case was crossing in a crosswalk, with the walk signal in his favor, and still was hit. The driver wasn't paying attention and was trying to run a light. Riding between stopped cars like that is also fraught with peril but the main issue here is that the driver simply didn't see the rider in time to miss him. She did see him early enough to only tap him with her car as opposed to running straight through him which undoubtedly saved his life. Reflective clothing and bike stickers - Most of my fall/winter commute clothing has reflective piping, screen printing, or decals. My bike and bags have them too. I even added a few. The best reflective material for stickers is the stuff they use to make road signs. There are various sources out there on the interwebs. "Other" lights - I have been experimenting with other forms of "non-traditional lighting" for my bike. (UPDATE: My bike light review!) Seeing a guy with his bike wrapped completely in Christmas lights inspired me. A couple of people around Seattle even have the Down-Low Glow. This subject will have to have its own after I have some time to play with the lights and actually review them. Not completely sold on the idea of bright clothing? This video does a nice job illustrating the difference between a cyclist wearing a bright jacket and one wearing all black. Which one would you rather be while riding in traffic on a rainy night? As far as overall safety is concerned you can't beat trails. Without the threat of cars your chances of actually dying while riding are significantly reduced. While this is true about fatalities it is not necessarily true about injuries or incidents in general. Trails are filled with other types of traffic such as walkers, joggers, kids just learning to ride their bicycle, skateboarders, roller-bladers, and, my all-time favorite, cross-country skiers. Yes, I have seen skiers on the trails that I use in the Redmond area but they are typically riding on skis with wheels. If this were Butte, Montana there might be real skiers on the trail but that would require actual snow. ...or cross-country snow boarders. You can't make this stuff up, but I digress. I have a commute route that is back roads and trails all the way home. Yes, it is about 2.5 miles further but on cold, dark, rainy days I would much rather take the long way home and meet 2-5 cars than be passed by 100+ cars with impaired visibility and stopping distance. Watch out for young kids on small bikes. Multi-use trails, like the Burke-Gilman Trail in Seattle or Lake Shore Drive in Chicago, have all types of traffic but young kids, although cute, are the worst. They are unsteady, slow, and, worst of all, unpredictable. Don't get me wrong, I love watching little kids learn to ride, and they should always be allowed on public trails, but I find them very difficult to ride around safely. DO NOT wear headphones. They are very distracting and you can't hear me yell "on your left". Or the cursing of that jogger you just side-swiped. Watch out for Dog Walkers. Gotta love them. Most dogs are curious and want to play, unless they are looking to chew off your face. Either way dogs love to come toward you or dart across the trail to clothesline you with their leashes. Give them lots of room, slow down, and keep your hands on the brakes. If you like to ride faster than 15 MPH then roads are pretty much your only legal choice in Washington State. Some trails have speed limits at 15 MPH, some don't have any, and some are as low as 10 MPH (no, I'm not kidding). I have heard a few cyclists say that you must assume that all cars are trying to kill you. While this does put you in a defensive mindset while riding, which is a good thing, it can make you over paranoid and that doesn't really help you ride safer. You should ALWAYS be on the look-out and ready to react. ...even when you are riding across Africa and forget to yield to cross traffic, which apparently doesn't stop. Get a rear-view mirror. I use the 3rd Eye bicycle mirror bar end mirror. It has the perfect mix of adjusts and stability. Stay OFF the sidewalks! The only times I have EVER come close to hitting a bicycle rider while driving my car was when they were riding on a sidewalk at a faster-than-jogging speed (i.e. more than about 8 MPH). Drivers don't expect sidewalk traffic to be going faster than that speed so they rarely look. Your local and state laws may differ significantly from Washington State so make sure to do your homework. When I am riding in traffic I go for bike lanes and wide shoulders, preferring roads with these features over those that don't. If you find yourself on a road without either I suggest taking up a lane. Yes, I mean that you should block traffic if you have to. If you ride too close to the right then cars are tempted to squeeze past in the remaining space which may not be the safest thing for you, the rider. You should always use your best judgement and obey traffic laws but that is my personal suggestion about lane placement. Call them drafters, pace lines, wheel suckers, whatever.. I hate them. Not that I personally dislike the riders I just don't like riding that close to other riders. It rarely turns out well for me. Several times, as recently as last month, I have almost crashed in pace-lines because of the stupid actions of another rider. Being in a pace line is a privilege, not a right. If you learn the etiquette and hand signals for pace line riding it can be a life-saver on long rides. It can also be a disaster. Moral of the story: don't use aero-bars unless you are at the FRONT of the pace line. Many times people have come up behind me to draft and I don’t even know they are there. Now that I ride with a rear-view mirror this is not as much of a problem. One day back in '07, while riding home on a local MUT, I passed a guy going the other direction who waved vigorously and shouted, “Hi Tim!” Someone behind me shouted something like, “Hi Mark!” He was so close it almost made me jump out off my bike. I had no clue he was there. Perhaps I should be doing a routine clearing of the baffles a la “Crazy Ivan” from Red October (my wife’s suggestion)? Drafting behind someone without their knowledge seems like a very dangerous situation. Not long after that I was riding on the Sammamish River Trail from Bothell to Redmond in Washington State. I passed through a section with some tight turns under a railroad trestle in Redmond. As I came around one of the bends I found a mother goose crossing the trail with her goslings. Canadian geese are very common in Redmond along the Sammamish River, especially in the fall and spring. Good thing I had already slowed down for the blind curves. When I saw the geese I hit my brakes hard and came to a stop when I suddenly heard, "Oh Sh*t!" behind me followed immediately by the unmistakable sound of metal hitting metal and carbon fiber several times. I immediately jumped to the side thinking I was about to get hit from behind. Scattered on the ground behind me were 4 riders all in a heap. They had been drafting me and I didn't even know it. They all ended up riding away from the scene with only scrapes and bruises leaving me shaking my head. As they rode away I called out, "How long were you guys behind me?" "Since Woodinville." That was 6 miles or about 20 minutes given my average speed back then. The next week I bought a mirror. Stay away from me. Seriously. If I wanted you to draft me I would invite you. The only drafting I allow is in times of war. Make sure the person you are drafting knows that you are back there. Shout something like, "On your wheel!" or "Do you mind if I draft?" Know the etiquette and hand signals for turns, slowing, road hazards, etc. The best way to do that is to ask someone because everyone seems to do it somewhat differently. Only take the lead if you know what you are doing. If you don't have a clue how to lead a pace line admit it and ask to stay back in the pack. If you screw things up you will get some choice words from the other riders and then dropped like 3rd period French. I live around hills. Big hills. Think "San Francisco" style hills. They simply can't be avoided. Don't believe me? My rain route has a hill section 200m long with an average grade of around 16% and a max of about 20-22%. I don't always have to take that route but the alternatives are a 1 mile hill with a 10% grade and a 1/2 mile hill with a 13% grade. A pitch like that will get your attention. Going up steep hills is one thing but going down them, especially in the rain, can be tricky. In 2007, when I got back into cycling, I bought a cheap bike computer. One day I was going down my favorite hill, in traffic, and decided I was going fast enough to "take the lane" and ride with traffic. I knew I was going over 40 MPH but it didn't feel all that fast. When I hit the bottom I glanced down at my bike computer to find my max speed: 52.7 MPH. Holy cow. That was, and will remain, my fastest recorded land speed record. On that descent I pulled into traffic about 50 feet behind a panel truck, thinking they might be safer to follow than an SUV or mini-van. What I didn't realize was that, even at 50 feet, I was still in his air pocket. In a sense I was drafting him. That's why it didn't feel that fast. I pondered on that speed all day. That was a risk I should not have taken. I control my speed much better now. Over at the Fat Cyclist blog, Fatty tells about his experience riding in France where one of the riders in his group crashed on a fast downhill. That little incident resulted in multiple fractures for the rider, one of them a compound fracture. Check your brakes frequently - The last place you want to discover your worn out brake pads is when you are bombing a descent at 40 MPH. Your helmet is not rated for crashes at that speed and spandex... well, you get the picture. Consider ceramic-coated rims for your next wheelset - They offer similar stopping power to disk at much lighter weight and can be put on just about any bike. Keep your speed under control - The best way to minimize stopping distance is to minimize speed. Yes, I love to bomb down my favorite hill but only in good weather and during light traffic. Other times I keep my speed down and my hands on the brake hoods. Get to know the stopping power of your brakes and how long it takes to do an emergency stop. Have you ever TRIED locking up your brakes at 30+ MPH? Would you be able to keep control and execute an evasive maneuver? The best time to practice is NOT while trying to avoid a BMW or SUV in traffic. From early November through March I am constantly checking the weather forecast. Is there snow in the forecast? I would hate to get stuck at work with my bike during a snow storm. I'll bet I could get a lot of work done! When I get up in the morning the first thing I look at is the temp outside. If that temp is below 35 degrees I don't ride that day. Or, if the sun is coming out, I wait until the sun has been up for a while to warm up the roads. Two-wheeled vehicles don't fair well on black ice. They tend to lose verticality. There are companies that sell studded bike tires and one of these days I may make the jump. At $70-90 per tire I think I'll wait a bit. This only applies to professional triathletes but I'm sure there is a fair number of pro cyclists with the same idea. There is an amazing trend in professional Triathletes: a growing number of top pros are training almost exclusively indoors. Nearly infinite ability to completely customize the workout (no reliance on location of hills or long straights). Think about it for a minute. If your income and livelihood depend on your ability to perform on race day why would you go out and mix it up with crazy motorists, dog walkers, ninja joggers, and all the other idiots and road hazards out there? Training indoors makes perfect sense for that group of people. It just doesn't make sense for me. I do have an indoor trainer which I use when the temp drops below freezing. Otherwise I would go NUTS spending all my riding time indoors staring at the walls or watching TV. No post about bike safety is complete without an '80s era rap video about riding safely. "Strap it on kids, and WEAR YOUR HELMET WITH PRIDE!" Posted in Commentary, Commuting, Cycling and tagged with bike commuting, cycling. October 18, 2011 by Lee Donnahoo. Cycle Oregon Countdown: 10 days to go! 10 days to go until Cycle Oregon 2011! I have a countdown on my door at work which reminds me every time I walk into my office. The Top 10 best songs for cycling to be played from a SAG wagon. OK, it started as 10 and grew to 15 before I was finished. And then 20 when I added the hill climbing songs. Disclaimer: I don't wear headphones when I ride and neither should you. I do wear them when I am inside, on my trainer, and looking at the 4 walls of my family room on cold, wet, and icy winter days. Cycle Oregon 2009 SAG Wagons at Glendale, OR According to Wikipedia, which is never wrong, a SAG wagon is a vehicle that follows riders on a race or recreational ride to pick up riders who are unable to complete the event. Why "SAG?" It's supposed to be short for riders who are "sagging behind". They usually have a driver and a radio operator and carry supplies for the riders. On Cycle Oregon they have loud speakers mounted on the roofs which they use to play motivational music for the riders. SAG wagons are basically party wagons. The CO SAG drivers/volunteers usually have a theme for their crew such as pirates, cowboys, race car drivers, etc. On the Cycle Oregon forum they asked what type of music they should play? Such is the genesis of my list. Bicycle Race - Queen: This absolutely must be in every cycling play list. It's the law. Don't bother looking it up because you will find it on every law book, article, or court judgement regarding cycling play lists. Cool, Clear Water - Marty Robbins: I know what you are thinking. No, I haven't lost it. They should play this on long, hot climbs. Trust me on this one. Slow Ride - Foghat: For when you need to slow down and chill. Runnin' Down a Dream - Tom Petty: Makes me want to ride fast every time I hear it. Danger Zone - Kenny Loggins: This one works best at the top of big hills just before you descend. I Was Made For Loving You - KISS: One of the worst songs KISS ever produced (come on, it's DISCO!) but it has a great driving beat and inane lyrics that make you want to run away. Or pedal really fast to get away from it. MAKE IT STOP! MAKE IT STOP! Radar Love - Golden Earring: Come on, it's half past 4 and I'm shifting gears! Doesn't that make you want to pick up the tempo? 1 Bourbon 1 Scotch 1 Beer - George Thorogood: I don't know why but I love to ride to this song. Jailbreak - Thin Lizzy: This song makes me want to ride. Not sure why. Immigrant Song - Led Zeppelin: Hard to beat this one. Hard driving, good lyrics, great song for riding. Riding the Storm Out - REO Speedwagon: For some reason this one really speaks to me and, no, it's not just because it has the word "riding" in the title. This song means road trip. Going the Distance - Cake: Are you going the distance? Are you going for speed? Hopefully my wife will not be in a time of need while I'm away experiencing the wonders of southern Oregon. 15. Take Me Home - Phil Collins: The ultimate "going home" song from an iconic singer. AC/DC - TNT: Any AC/DC song may fit the bill here, but this is the one I like the best. American Woman - Lenny Kravitz: Not the original Guess Who song (which is a FAR better piece of music) but this cover does work really well in one scenario: it has a really slow beat which is great for climbing steep hills at a slow cadence. Like we did climbing up that Forest Service road out of Glendale, OR, on Day 5 of Cycle Oregon 2009. So Whatcha Want - Beastie Boys: Very funky beat that stays steady and keeps you moving. Can't ask for much more in a climbing song. Bad Horsie - Steve Vai: This is the "dark horse". OK, it's more like silver (watch the video). Probably one of the hardest driving bass lines of a rock song. Of course it also helps to tune your guitar down 2 full steps from E to C. Gives it that extra punch. So there you have it. These are MY favorite riding songs, your mileage may vary. I took out the climbing songs and put them into their own category below because they are that cool. I Predict A Riot - Kaiser Chiefs: Instead of this one I went with The Ramones. My Way - 7 Mary 3: Hard driving song. Also because 7 Mary 3 was the call sign of Ponch from Chips. Slow Ride - Kenny Wayne Shepherd: I have loved KWS's music since I first heard him back in '95 when he was just a teenager. Good song but it didn't make the cut. Fire - Jimi Hendrix: I loves me some Jimi but the beat is constant enough in this song. Momma I'm Comin' Home - Ozzy Osbourne: This one almost made the top 15 until I saw an even better "coming home" song in Phil Collins. Sorry Ozzy. You still ROCK! Posted in Commentary, Cycle Oregon, Cycling and tagged with Cycle Oregon, cycling, music. September 1, 2011 by Lee Donnahoo.